Sieve well. Dry roast rice flour until hot. Dry roast wheat flour until you get a nice aroma. Melt butter and keep ready. Cut coconut into small pieces. Crush jaggery, dissolve in little water and strain it without any dust, dirt or mud. 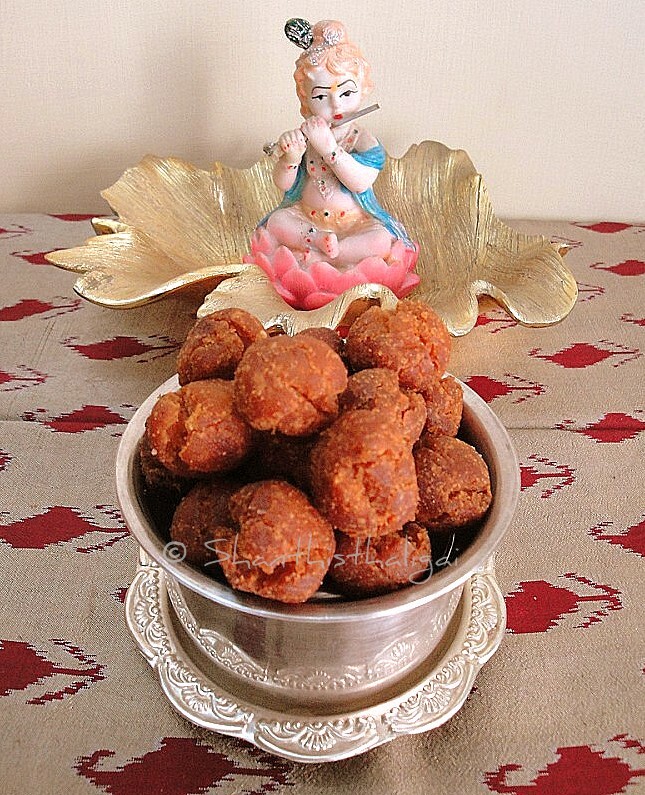 Heat jaggery and make a syrup of soft ball consistency. (Sugar syrup consistency - detailed post is here). Add all ingredients (except oil) to the syrup and stir without any lumps. Switch off the stove. Add coconut milk to make a smooth dough. Knead well when still warm. Allow it to cool. Make gooseberry- sized balls from the dough. Heat oil in a kadai. Fry 5- 6 balls at a time, in medium heat, until golden brown.